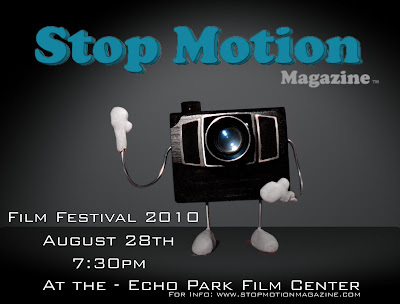 Stop Motion Magazine: Official Entry Selections and Festival Event Announcement!!! Official Entry Selections and Festival Event Announcement!!! Here's what many of you have been waiting for, the official announcement of the Stop Motion Magazine Film Festival Selections!!!! YEAH!!! Admission is $5 and open to all ages. Space is very limited (Only 55 seats) and there is only 1 Showing. We will be Streaming the Event Live for those of you around the world unable to attend. Please go to our Website in the Festival page we will have a player boradcating on that day. Check the World Time Clock for appropriate time in your region of the world. Festival is held in California (Standard Pacific) Time. We hope all of you enjoy the event and hope to see you there. June 2010 Issue #6 Available Now!! !